Most parts of the country were classified as minimally food insecure, a situation where households can secure food and non-food needs without changing livelihood strategies. The situation in this period has improved significantly compared to April-June 2013 when 145 VDCs were classified as food insecure (134 moderately food insecure and 11 highly food insecure). 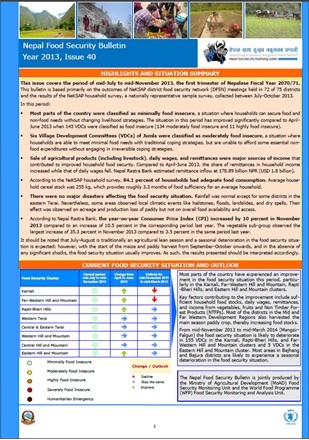 Six Village Development Committees (VDCs) of Jumla were classified as moderately food insecure, a situation where households are able to meet minimal food needs with traditional coping strategies, but are unable to afford some essential non-food expenditures without engaging in irreversible coping strategies.